Explore the Region from Coast to Cactus is an interactive website that illustrates the biological richness of southern California by taking users on a journey through its diverse habitats and the plants and animals that live in them. San Diego is known for its incredibly diverse terrain, ranging from the beaches and chaparral near the coast, to the mountains and the desert farther afield. This terrain is what makes the region one of only 35 biodiversity hotspots in the world, meaning areas that have the highest concentration of different species of any geographic area of similar size. Featuring species profiles, habitat descriptions, unique places to visit, and stories about the people who have deepened our understanding of the region, Explore the Region from Coast to Cactus is a dynamic tool that gives users the ability to go out, identify and record species, and explore the region on their own. In January 2015, the San Diego Natural History Museum opened a new, 8,000 square foot permanent exhibition, Coast to Cactus in Southern California, that invites visitors to explore the unique habitats of Southern California. The Balboa Park Online Collaborative (BPOC) team, in collaboration with staff at the Museum, developed a website to accompany the exhibition. The goal was to produce a web-based interactive map of the exhibition to enhance visitors’ understanding of the southern California region, to foster caring and stewardship of natural places, and to deepen citizens’ sense of place in the region. The Museum engaged Designing Insights LLC to conduct a usability evaluation of the website in order to assess if the site is clear, usable, and intuitive. The evaluation was conducted on an in-progress beta site (http://coast.sdnhm.org) utilizing a Heuristic Evaluation and Think Aloud User Tests. The evaluation showed that users felt that (1) Using a map of the physical space as the primary organizing principle is problematic for online-only use, (2) it’s unclear what content a user will see in the actual exhibition versus additional content that is only available online, (3) limited content and content specific to the in-person experience is not successful online, (4) legibility over imagery is poor and color-coding is unclear, and (5) content access is inconsistent; content nomenclature and categories are not always clear. After reviewing the findings of the evaluation, we renegotiated our contract with BPOC to redesign the website from top to bottom. 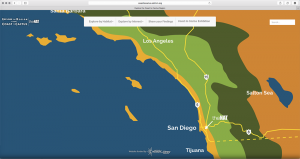 The new website (http://coasttocactus.sdnhm.org) design addressed the five most problematic areas (listed above) that were identified in the evaluation. As a result, the new website: (1) engages a user through an interactive regional map of southern California, not a map of the physical exhibition, (2) presents content relevant to regional exploration rather than the exhibition itself, (3) streamlines content categories and nomenclature in navigation menus, and (4) makes content browsing primarily image driven through the use of a familiar visual grid. For users who want to enhance their connection to the region even further, we provided an avenue to do this through Share Your Findings. This section lists links to citizen science opportunities, two of which (Amphibian and Reptile Atlas of Peninsular California and Flying Squirrel Study) are research programs run by the Museum. The third, iNaturalist, is a project in which our scientists are active participants. The fourth means of enhanced engagement is Coast to Cactus Digital Scrapbook, where users can submit photos—old or new—that depict the natural world throughout southern California. The images will become part of the Museum’s photo archive and may appear in the Digital Scrapbook within the Coast to Cactus in Southern California exhibition. Though we stripped the website of direct ties to the exhibition, there is a design aesthetic that ties it to the exhibition holistically (fonts, color palette, region, species). It is an expansion of the exhibition, giving users tools and information to get out and experience the natural world for themselves. The Museum has again engaged Designing Insights, this time, to conduct a follow-up Usability Evaluation of the redesigned Explore the Region from Coast to Cactus site (http://coasttocactus.sdnhm.org). In addition to conducting user Think Aloud tests, Designing Insights will evaluate the redesigned site against the findings from the original Heuristic Evaluation and assess the changes that were made based on the heuristic findings. Users will be asked to follow the same or similar use-case scenarios and tasks as in the first evaluation. This follow-up evaluation will take place from April 15 – June 15, 2016.